This year I tried something new – a birthday run. Since I was not able to go to Massachusetts this year to run the Tornado Alley 57 Miler again, the new plan was to run 40 miles on my 40th birthday. I had trained for it and all went well up until a couple of weeks ago when I developed pretty severe blisters. I really cannot recall having blister issues in all my years of running since college anyway. I did get a doozie of a blister in college, but hey, we also wore cotton socks back then! Normally I do not run super long during the summer in Florida. I save my marathon training runs for the fall. I think between the longer runs and the Southwest Florida heat and humidity, it created the perfect storm. I wear really good socks, have custom orthotics, wear good fitting shoes, and use BodyGlide. Florida weather must be no match for even the best laid plans. I did no running at all for five days leading up to my birthday run in hopes that the blisters would heal and dry up enough to make it through 40 miles. I felt great when I started out this morning but around 13-15 miles, my feet were soaked and it was time to change socks and shoes. By the time I actually made it back to my car, I had finished 17 miles and knew the blisters were back. So the blisters were very painful for the rest of the day; each step hurt and made me question whether I could finish the full 40 miles. I changed socks several times, used Blistershield powder twice, and on the final sock change I used Aquaphor healing ointment. Blisters aside, I could not have predicted the outcome of the day. I was so blessed to have so many of my Suncoast Striders friends and Manatee High cross country runners out there with me. Sarah, Meagan, and Katie were there bright and early for the 7:00 a.m. start and with birthday cards and gifts too! Then Amber, Kristen, Canaan, and Ellen took over running duty on the 8:30 a.m. shift while Tiffany captured some great photos. By 10:00 I had logged about 17 miles when Janet joined me for a few miles and even created a custom cadence for me! Ellen ran out to buy me some watermelon and delivered it so I had a cold, refreshing treat at 25 miles. At just before noon Jessica and JP joined me for my toughest miles of the day. I had already taken one minute walk breaks after every mile completed from about mile 22 to 25 so once we reached 27, I broke the news about the walk breaks which they were happy to do. We were heading to my favorite part of the trail just after the 27 mile mark. It’s a nice shaded, single track trail along the water. Shortly after running (slowly) onto this trail, I started to feel a little light headed and running became so difficult. We walked almost the whole trail out and back and I had to make a tough decision. I had to listen to the signs my body was giving me and tell JP and Jessica that I had to call it a day. We were still a couple miles out from the parking lot so they graciously walked back the entire way with me. I am so glad they did! I think I was in worse shape than I thought. I felt light headed and really felt I had to focus my vision on the path ahead. And I was told later that I was slurring my words a little on the walk back. Yikes! When we reached the parking lot, we hit 30 miles total and saw Chris who was there to run the last leg with me. I had to apologize to him that I was finished and could not run anymore. He’s such an awesome guy; he ran my last 10 miles for me in the hottest part of the day at a preserve with little to no shade. I guess I looked fairly bad because Janet and JP then proceeded to stay with me until I refueled a bit and cooled off. I don’t remember how long it took for me to seem like my normal self again, but they hung out with me just chatting away and Janet had me sit in the back of her SUV which was cranking out the AC. Then Theresa and Dawn and her cute crew of minions stopped by to deliver birthday cards, flowers, and balloons. When I was finally feeling recovered enough to drive I left Robinson Preserve and took a detour on the way home for a dip in the pool and some quality time with my sister. So refreshing. All I could think about during the last 2-3 miles walking in the hot sun was how wonderful it would feel to be immersed in water! I didn’t weigh myself before or after the run today, but probably should have so I’d have a better idea of the state I was in. Deciding to stop my adventure today at 30 miles was extremely difficult. I did not want to let anyone down by not reaching my goal. But the most important thing I learned today is that I must listen to my body. We all must listen to our bodies! At blazing speeds, or so I thought. As you walked across the field. Never thinking that our adventures would end. My dad was my high school cross country and track coach. I wrote this in college when I was away from home for the first time in my life, missing my family, and being coached by someone new for the first time. While my dad does not coach me anymore or run anymore, I feel that the lessons I learned from him as a runner and coach have helped me become a better runner, coach, and person. I decided to post this poem as a blog entry for Father’s Day weekend as a way of thanking him and remembering those special moments. I would also like to thank my mom for being the most amazing, patient, and supportive mom, team mom, and volunteer assistant coach ever. She was there at every meet no matter how far away or how bad the weather. She would help injured runners out of the woods, take pictures, and be there at the finish never knowing what to expect. 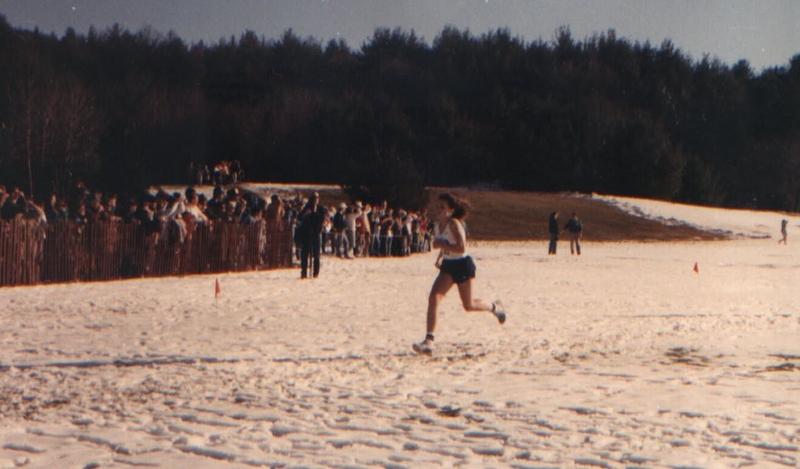 One of the two most memorable races with my mom was a home cross country meet when I was trying out a new insert in my shoe. The insert bunched up so badly and caused me so much pain that I literally crossed the finish line, pulled off my shoe, and threw it. Let’s just say I was a little frustrated and uncomfortable! I did not throw it at my mom, but she jokes that I did…it may have been in her direction since she was waiting for me past the finish line. The other was my junior year when I ran the mile in track and my mom took me to the WMASS championship when my dad was out of town. 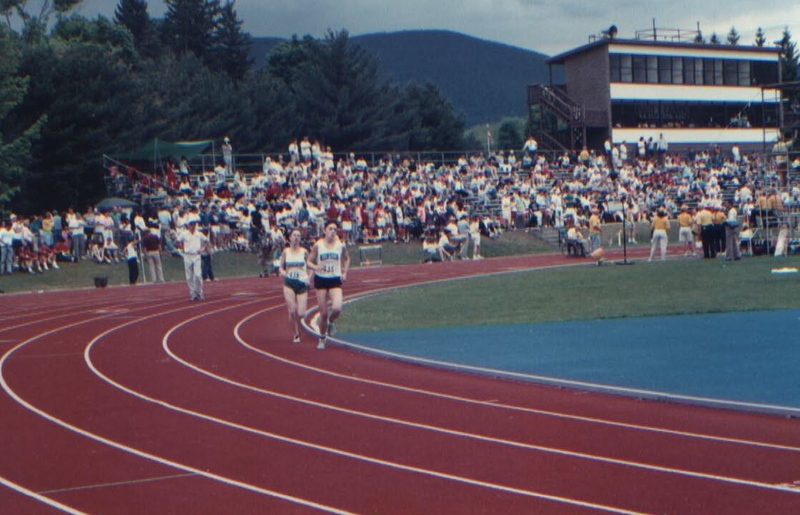 I ran as an individual since my school did not have a track team. We arrived at the meet and I was headed to the infield to pick up my packet and competition number when the coach from a neighboring school told me I would be disqualified if I went on the infield. I was so nervous since I had never been to such a big track meet before. My mom was not about to let another coach intimidate me so she took charge, went to the infield, picked up my packet, and I ended up winning and qualifying for state. Once I figured out that I wanted to be a running coach, all I have tried to do is be like my parents and do all the amazing things that they did for me. They kept it fun, always pushed me to be my best, and were supportive, caring, encouraging, strong, and understanding no matter the outcome of each race. You are currently browsing the RunnerGirl's Training (b)Log blog archives for June, 2013.